WASHINGTON (June 14, 2012) -- The Army birthday week is about recognizing more than two centuries of Soldiers defending freedom, and about saying thank you to those Americans that have ceaselessly supported them in the effort. The Army celebrates its 237th birthday, June 14. The birthday week, Secretary of the Army John M. McHugh said during a reception in advance of a Twilight Tattoo at Joint Base Myer-Henderson Hall, Va., June 12, is to "provide us each year the opportunity to pause and celebrate our incredible traditions, 237 years of going out, heeding the call, wherever that call is heard ... protecting freedom and defending innocence, and making a difference in the lives of deserving people." The Twilight Tattoo event is held during summer months on Joint Base Myer-Henderson Hall in Arlington, Va. During the ceremonial event, the precision drill and discipline of Soldiers of the 3rd U.S. Infantry Regiment (The Old Guard) is displayed along with music from the U.S. Army Band, "Pershing's Own." The secretary, who hosted the event, also said the birthday recognition is a thank you to Americans, such as those who would attend the Twilight Tattoo presentation, for their tireless support of Soldiers. "It should, and I would suggest respectfully tonight it is as well, an opportunity to say thank you," he said. "Thank you to the American people for the incredible support they have provided us for more than two and one quarter centuries." The Twilight Tattoo event is held during summer months on Joint Base Myer-Henderson Hall in Arlington, Va., near the Pentagon. 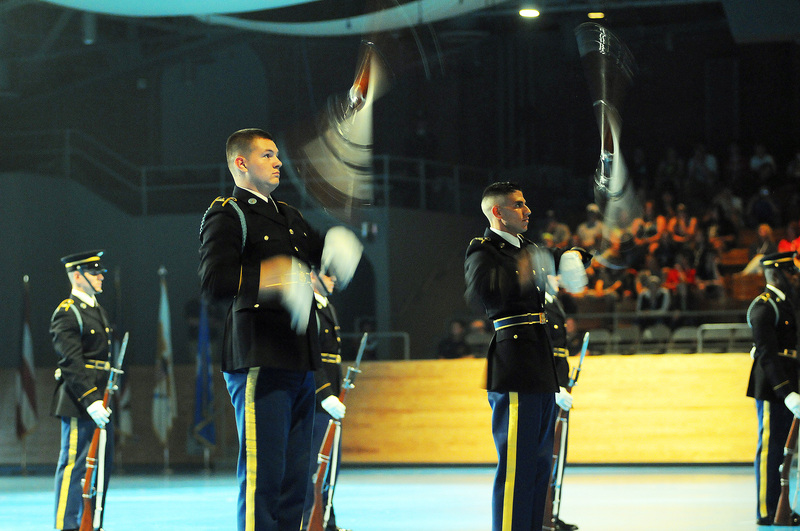 During the ceremonial event, the precision drill and discipline of Soldiers of the 3d U.S. Infantry Regiment (The Old Guard) is displayed along with music from the U.S. Army Band, "Pershing's Own." This tattoo event was held as part of the Army's birthday celebrations this week. Sgt. Maj. of the Army Raymond F. Chandler III also attended the event. Afterward, amidst the noise of the mostly out-of-state visitors to the event, who were on the floor mingling with and talking to the Solders who had just performed for them, Chandler said that having been a part of the Army's 237-year-long story has been to him an amazing opportunity. "It's quite an honor to be part of an organization that's 237 years old," he said. "You know we've got amazing men and women that serve every single day, and those who have served before -- this is an amazing opportunity." In the Army almost 31 years now, the Army's senior-most enlisted Soldier said leading Soldiers in combat has for him been the proudest moment of his career, "and to be part of something larger than myself." But of the Army as a whole, he said, he is proudest of the resilience exhibited by those that have made the choice to serve in uniform. "The thing I'm most proud about in America's Army is that we are so resilient," he said. "Not too many other armies around the world, if any, can do what we have done in the past ten years. These last ten years I think are really a testament to the American Soldier and their family and their resilience." Chandler's service extends back now more than three decades, and he said that in that time, he's seen changes in Soldiers, as well as changes in what America has asked of its Soldiers. Over the past 30-plus years, for instance, the nation has demanded more of Soldiers, and of the Army. "They have asked us to be more agile, more adaptive, more lethal, and more creative in how we go about our mission of protecting the American people," he said. "And I think we are just better than when I came in." Chandler said that Soldiers from more than 200 years ago -- those Soldiers that fought for America's independence -- and Soldiers now, share some commonalities that get to the very core of what it means to be a Soldier and to serve. "We serve our nation. We are proud of our service. We believe that we are part of something larger than ourselves, and that we are protecting the American way of life," Chandler said. "I think the same holds true today as it did 237 years ago." This week, around the Army, units will hold ceremonies large and small to recognize another year of sacrifice, service, time away from family and friends, dedication to country, and selflessness. During those ceremonies and after, whether in Afghanistan, Asia, Europe, Africa, or the Americas, Chandler said it's important for Soldiers to remember those who came before, who fought, who died, and who sacrificed for America's freedom. "Never forget those that have gone before us -- those that have paid the ultimate sacrifice," Chandler said. "Then remember to honor their sacrifice and their family's sacrifice in this time. Be proud, most of all, of what you do. You do something that less than one percent of the American people can do -- and that's amazing."